Looking to switch from Zendesk? Here are the best Zendesk alternatives and competitors to consider, based on hundreds of real reviews. If you’ve been looking for a tool to help you manage customer inquiries and service requests for any period of time, you’ve probably heard of Zendesk. Zendesk’s suite provides an all-in-one solution for organizations in need of a customer relationship management tool, help desk software, online knowledge databases, and more. In terms of robustness, Zendesk is at the head of its class. However, Zendesk isn’t for everyone. For one thing, the software’s robustness and advanced functionality can actually be a turnoff for organizations with limited time and resources on hand. For startup companies operating on a budget, Zendesk might simply be too much for them to handle for the time being. Going along with this, many users report that Zendesk seems to have already “done it all” in terms of features and functionality. According to one Capterra review from earlier this year, "Zendesk seems to have done all of its innovation years ago as the product has achieved a plateau of functionality of features." Additionally, while Zendesk does provide a number of purchasing options and pricing tiers, some companies may end up spending more than they’d hoped to receive the specific features they need. On the other side of this, smaller companies that do purchase the entire Zendesk suite may not end up using all of the tools it includes, anyway. 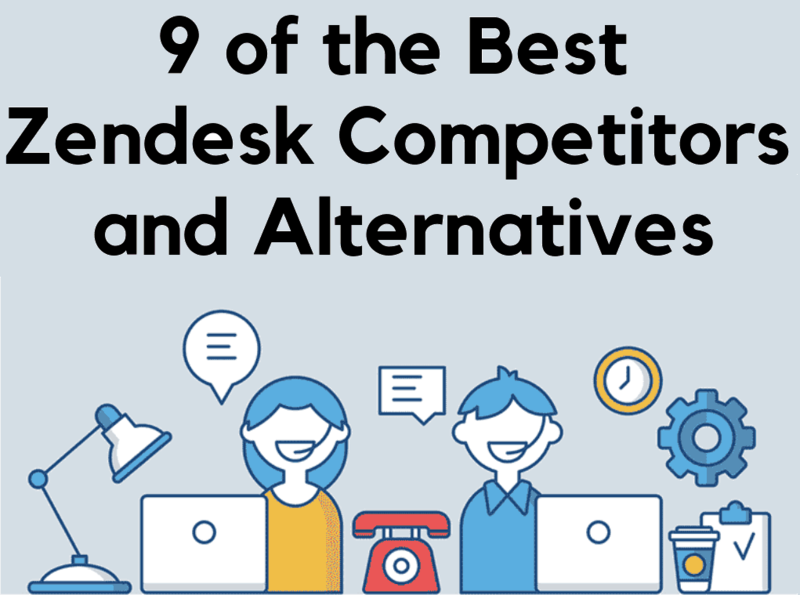 Without further ado, let’s dive into the nine best competitors to Zendesk's popular help desk software. Of course we’re going to have our software a the top of the list. It’d be silly not to, no? Anyway, Helpjuice focuses specifically on enabling users to create a fully-customizable knowledge base to be used by both internal employees and their customers. Such customization allows users to tailor the look and feel of their customer-facing knowledge base to that of their brand. As far as functionality goes, Helpjuice allows for simultaneous internal editing of knowledge base documents – meaning multiple agents can collaborate remotely to make improvements to a single document at a single time. Additionally, agents can tag and categorize documents as appropriate, allowing their customers to easily find the answers they’re looking for. 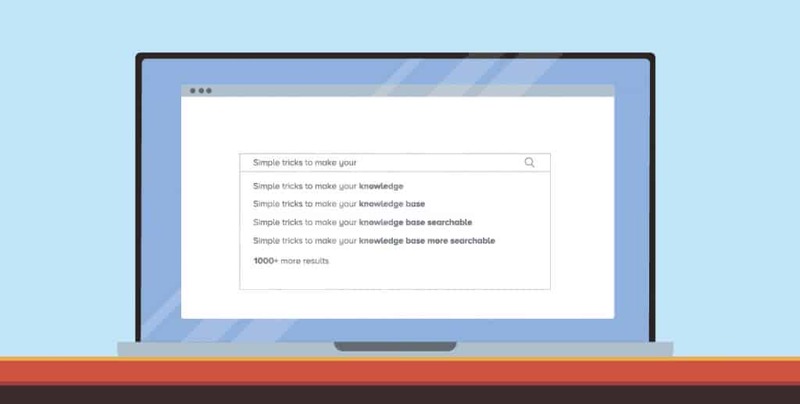 Customers can find these answers by either browsing the knowledge base manually, or by using Helpjuice’s intelligent search capabilities. Helpjuice also provides in-depth reports and analytics regarding customer inquiries, in turn allowing users to focus on developing content and documentation to provide more valuable information to their customers. Do you want to receive 50% less support emails while having more happy customers? Sign up for a 14 day free trial to see how Helpjuice can help your business with improving customer relationships. Microsoft Sharepoint is a document management and storage system that integrates fully with all Microsoft Office programs. While most often used as a way to create websites specifically to be used by internal teams, Sharepoint can also be used to create customer portals and knowledge bases, as well. Like Helpjuice, Sharepoint allows for secure and collaborative editing of documents and other content meant for both internal and external distribution. For organizations looking for a way to centralize internal data (e.g., anything from customer-related information to payroll and PTO), Sharepoint provides a straightforward solution. One of Sharepoint’s main selling points is its focus on security, coupled with the fact that it can be edited from any device and/or location by those who have been granted permission. This means documents and other information can be updated “on the fly” at any given time. Also, in addition to integrating with other Microsoft tools, Sharepoint also integrates with a number of third-party tools as well. Users should easily be able to transfer data to and from Sharepoint from most other software databases they use. Finally, as we mentioned above, Sharepoint is easily customizable depending on the user’s specific needs. Essentially, if your organization needs an internal website for any reason whatsoever, Sharepoint has you covered. On the downside, those who use Sharepoint report that the tool basically requires customization – which typically requires more in-depth technical knowledge of how to build internal websites. Additionally, the learning curve for Sharepoint is rather steep. Since using the tool requires a good amount of experience with building websites in the first place, it’s not something you’ll simply be able to pick up and use. Basically, Sharepoint isn’t for smaller, less-tech savvy companies operating on a budget. Not only that, but larger companies that have the capacity to operate such tech-heavy software can most likely afford the more robust options we’ll mention on this list in a bit. 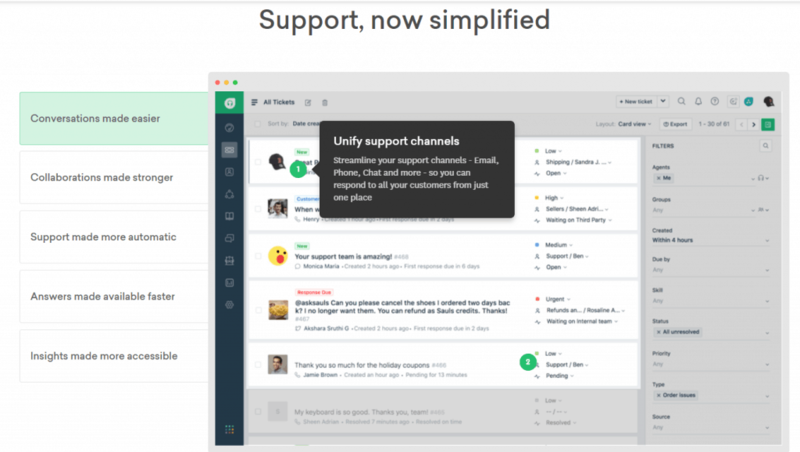 Help Scout, a help desk and customer service software solution, is a popular Zendesk alternative due to the fact that it provides a variety of services to its users. Help Scout also makes it easy for organizations to track engagements with specific customers from the moment an internal ticket is open to the moment the issue is resolved. This allows all internal teams to remain on the same page when working through a specific customer’s problem. Finally, Help Scout enables companies to create customer-facing self-services portals. These portals can include knowledge bases and other such content to help customers find the answers they’re looking for without needing to contact customer support. Help Scout’s main draw is that it’s incredibly easy and intuitive to use. Even users who report a bit of a learning curve for the tool claim that it’s easily overcome just through regular use of the software. Going along with this, Help Scout’s features and functions are straightforward and simple. There’s no complexity for complexity’s sake, here; what you see is what you get, and that’s often enough for most users. Finally, as is to be expected from a help desk tool, Help Scout’s customer service and support teams have an excellent reputation among its user base. Not only are support agents quick to provide assistance, but they’re also quick to fix any issue their users might encounter. The simplicity of Help Scout means that the tool may not be the right fit for those looking for a more robust or advanced tool. In terms of being a true alternative to Zendesk, Help Scout doesn’t measure up (not that it aims to, by any stretch). Another issue many users have encountered is that Help Scout’s mobile app isn’t on-par with its desktop counterpart. Between slow loading speeds and outright glitches, the mobile option for this tool leaves much to be desired. Speaking of slow loading times, some users have claimed that uploading and downloading documents within Help Scout can be a downright pain. Unfortunately, when the name of the game is real-time flow of information, users simply can’t afford the downtime that sometimes arises, here. Freshdesk is another help desk solution that focuses on usability and affordability. With Freshdesk, organizations can set up automations to handle specific customer inquiries as appropriate. This includes automatic delivery of help desk tickets to the correct department or agent, prioritization of inquiries based on severity, and auto-responders for instances in which a hands-on response isn’t necessary. Freshdesk also understands the importance of real-time updating of information and documentation. The software includes agent “collision detection,” ensuring that multiple agents don’t accidentally pick up and work on a single inquiry when only one person is needed. Additionally, information and documentation produced by either the customer or agent can easily be uploaded “on the fly” to Freshdesk’s knowledge base – meaning such content can continually be updated over time. Like Help Scout, Freshdesk is incredibly easy to use due to its minimalistic user interface. However, as many users report, despite its simple and straightforward nature, Freshdesk is a much more robust tool than the software mentioned above. Another strong point of Freshdesk is that its developers continue to test and tweak the software to perfection based on user feedback and other such data. Unlike Zendesk, as we said earlier, Freshdesk’s users continue to see improvements in the software as time goes on. It’s also worth noting that many of Freshdesk’s users have actually noticed how free of technical glitches the tool is. This is one area in which “no news is good news,” so for users to actually take a step back and realize how streamlined the software is says a lot. While we mentioned that Freshdesk’s simplicity is typically seen as a strength, some users say they’d like to see more in the form of customization. This goes for everything from the aesthetic appearance of customer-facing portals to the functions presented on internal dashboards, and also to the reports provided by the tool. Also, some users have reported minor issues in which certain automations cause redundant messages to be sent internally. For example, one user reports that agents will receive duplicate emails if a ticket is automatically assigned to their department and personally to them. Finally, though the aforementioned collision detection works as far as ensuring a single ticket isn’t picked up by multiple agents, users have reported instances in which the customer submits multiple tickets for a singular issue – which can cause internal problems if not caught immediately. Intercom’s customer messaging platform focuses on enabling organizations to build authentic relationships with their clients throughout every stage of the sales funnel. 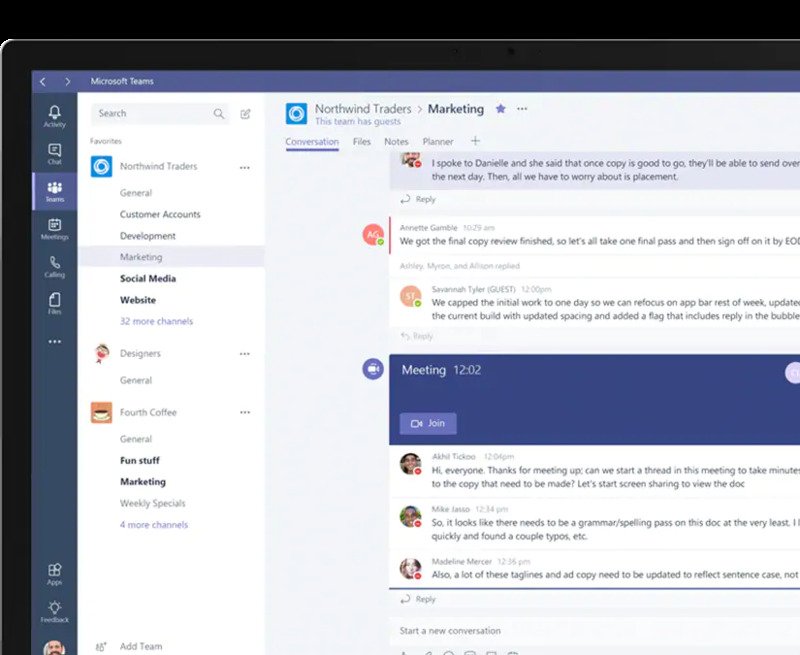 With Intercom, users can communicate with their customers via live chat, email, and even in-app messaging and push notifications. This enables companies to reach out to the right people on the right platform, at exactly the right time. Intercom also allows users to create in-depth knowledge bases, as well. This allows clients to quickly and easily find the answers to both simple and more complex questions without needing to have a customer service rep step in. Of course, Intercom’s messaging services also make it easy for agents to provide assistance as necessary. After a client’s issue has been resolved (or has not been resolved), Intercom provides the company with a report regarding the issue at hand. This allows organizations to revisit their knowledge base and make the appropriate changes to specific help documents. Most users report that Intercom is incredibly easy to use. 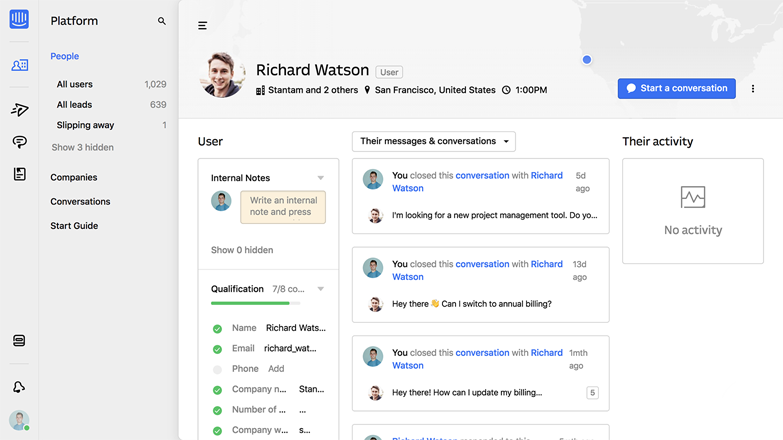 Many reviewers claim they were able to get their entire team oriented with Intercom within mere hours. Additionally, since communication and collaboration is a key feature of Intercom’s software, this aspect is the tool’s main strength. Not only is communication with clients streamlined and efficient, but reviewers also report that all departments within their organizations were able to maintain much closer lines of communication after adopting Intercom. Finally, users claim that both the desktop and mobile versions of Intercom are on-par with one another. Compared to many other tools on this list, this is a major plus for Intercom. More than one reviewer has referred to Intercom as a “jack of all trades, master of none.” That is, while the tool offers a variety of features and functions, it doesn’t outperform the other tools on this list in most areas. Also, while most users list Intercom’s data reporting as being decent enough, others are left wanting a bit more from this aspect of the software. For example, at least one user has expressed a desire to be able to view and compare reports from multiple instances regarding a single customer – but has had to view each manually. Finally, some see Intercom’s pricing structure as rather arbitrary, and a bit confusing. Many users won’t necessarily need the “full package,” but trying to figure out which features they actually need (and are willing to pay for) isn’t exactly a simple process. LiveAgent is primarily a help desk software that focuses on helping organizations streamline the processes of ticket intake and service provision. Of course, this goes a lot deeper than it sounds. Basically, LiveAgent provides an all-in-one solution for companies looking to build a call center, provide live chat via website and social media channels, and create a knowledge base for its customers to use at their convenience. LiveAgent also gamifies the process of providing customer service, allowing agents to earn “badges” for completing certain customer-related tasks as needed. This enables organizations to identify top performers – and also to determine where extra training may be necessary for some. LiveAgent’s main selling point is that it provides numerous ways for organizations to connect and communicate with their clients – from live chat and email to telephone and video chat. LiveAgent also provides automated customer service options via text and IVR, as well. LiveAgent’s customer-facing portals are also fully customizable and brandable, meaning organizations can tailor their channels to fit the feel of their brand. In turn, the customer experience becomes streamlined even as the client seeks additional assistance. Finally, many users report that LiveAgent’s support team is not only very responsive, but also incredibly knowledgeable and helpful. Those who reported having any kind of issue with the software were quickly able to fix the issue and get back on track. While LiveAgent’s customer service team is very helpful, some users report needing to rely on this team rather often – especially during the onboarding process. That is, the software seems to lack proper documentation and instructions for organizations just getting started with the tool (especially for less tech-savvy organizations). Additionally, though LiveAgent’s customer portals are fully customizable, some users report noticing glitches regarding certain font and image usage. Some report instances in which a the physical appearance of a ticket or other such document changes after being sent off to customers. Finally, users in the past have mentioned that LiveAgent’s mobile app isn’t as robust and streamlined as the desktop version of the software. 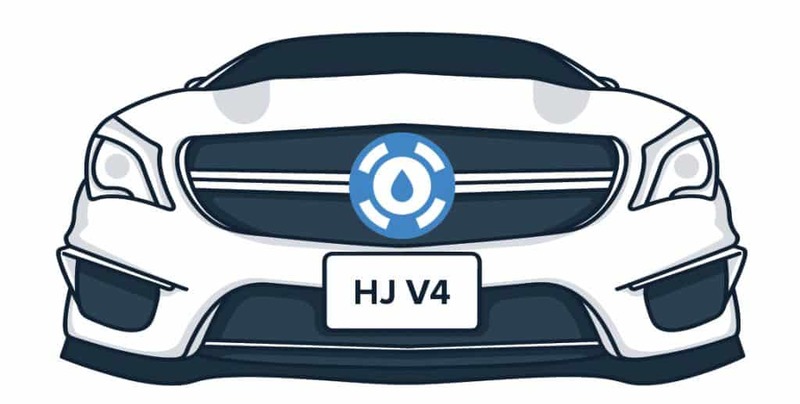 However, LiveAgent claims that, as of August 2018, the team is working on making improvements in this area. 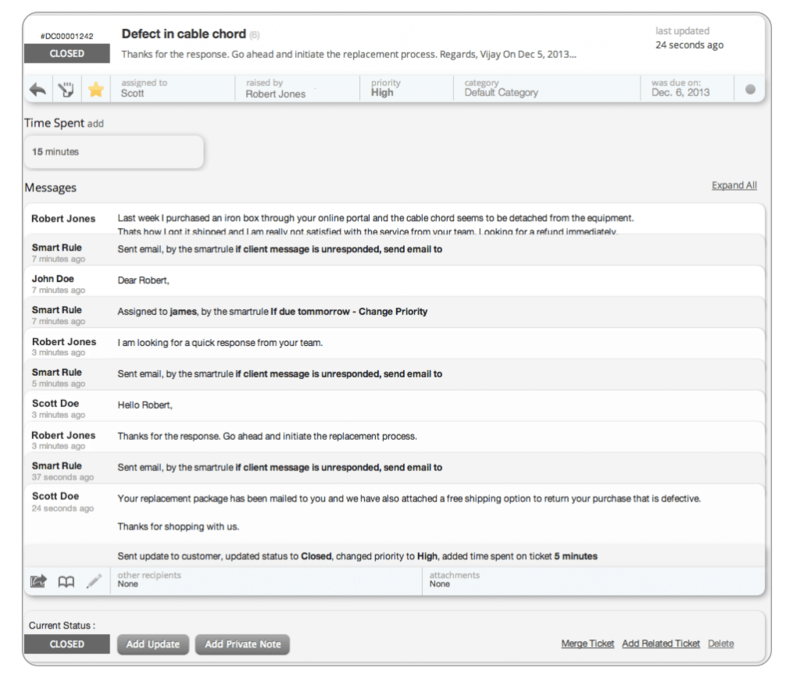 Similarly to LiveAgent, HappyFox is an all-in-one solution for an organization’s help desk software needs. 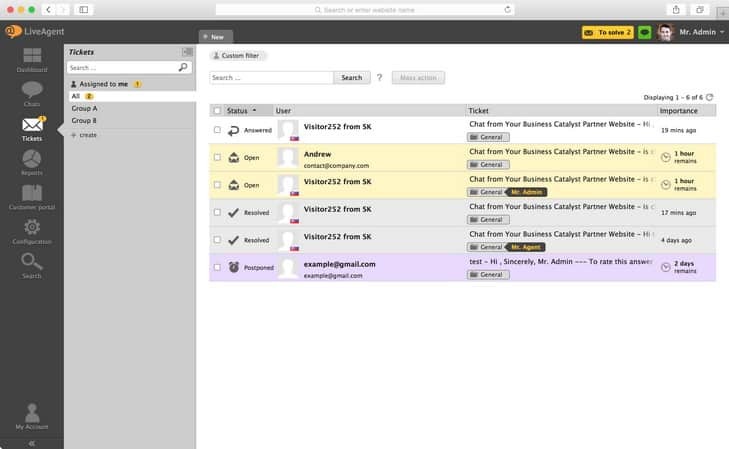 With HappyFox, users can provide support to their clients via email, live chat, social media, and by phone. This enables support staff to reach customers where they want to be reached – making the entire process easier for everyone. HappyFox also enables organizations to create a knowledge base, which integrates with thetool’s self-service functionality. Not only does HappyFox’s self-service portal provide information regarding the content of a customer’s inquiries, but it also allows them to check up on info regarding the logistics of their issue (e.g., ticket status, previous engagements, etc.). As we’ve said before, collection of real-time data is essential in order to avoid overlaps between agents, and/or delays in service provision; HappyFox’s users say this is where the tool stands out clearly above the competition. Despite offering a number of options for communication between company and client, HappyFox’s ticketing and documentation system are streamlined to perfection. Additionally, any and all information gleaned from customers during a support session are tracked and documented via HappyFox, allowing organizations to easily update their knowledge base and other customer-facing content. This also allows companies to pinpoint the need for further training on the part of their support staff. 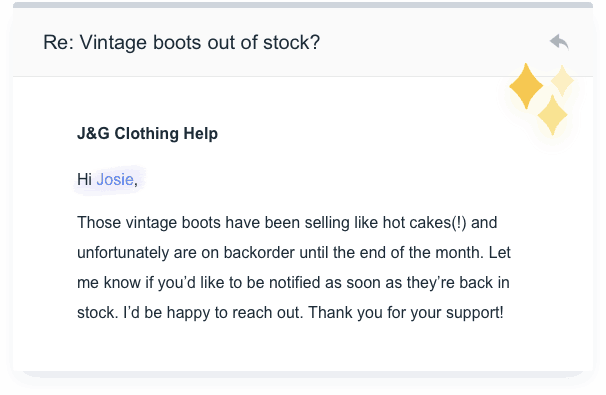 Finally, HappyFox’s support team is incredibly helpful and knowledgeable. Users report that support staff was either very hands-on during the onboarding process, or at the very least was a phone call away. The main complaint we’ve noticed regarding HappyFox is in its lack of robust features and reports. It’s not so much that reports aren’t in-depth, but more that they aren’t very customizable for companies who do want to dig deeper into their customers’ data. Also, while many users say the pricing structure is fair in terms of what you get in return, others say HappyFox likely isn’t useful/affordable for startups just getting off the ground. Reason being, it requires a three-user minimum (which some startups may not have capacity for at the moment). Additionally, some of the features of even the basic version of the tool may be more than a startup currently needs. Groove is another Zendesk alternative that streamlines the process of collecting customer inquiries and providing support as needed. With Groove, agents can provide customer service and support via email, Twitter, Facebook, live chat, phone, and even through text message. Groove also allows multiple agents to collaborate on a single support instance in real-time, via both customer-facing channels and private internal means. Companies can also use Groove to create a knowledge base and customer portal, as well. On these platforms, organizations can present information via text and/or multimedia to help their clients quickly find the information they’re looking for. Additionally, Groove allows users to create a support widget to be displayed on their website. This streamlines the process of engaging with the knowledge base in the first place, and also allows clients to open support tickets when absolutely necessary. Groove’s users love the tool’s clean and intuitive UI. One reviewer went as far as to say that “even (their) veteran staff” was able to quickly learn the ins and outs of the software and begin using it almost immediately. Another plus is the ability for Groove users to create custom categories for incoming support tickets, and set up automations to categorize tickets accordingly. This way, users can define specifically who among their support team will receive tickets relating to a certain issue. Also worth noting is the number of powerful integrations offered by Groove. Most users have been quite satisfied with the ease in which they were able to migrate data from their current system into Groove’s database. The other main downside of Groove is that customer-facing portals aren’t entirely customizable or brandable. In other words, while the content of your knowledge base will be your company’s own, the knowledge base itself feels like it was created by an entirely different brand. While many of the tools we’ve discussed provide a variety of communication options, AzureDesk focuses mainly on support via email. By integrating with an organization’s current email system, AzureDesk assures users that they’ll be able to easily track tickets and provide support as needed. AzureDesk also allows users to easily prioritize and categorize tickets as they come in, in turn enabling organizations to assign issues to the best agent for the task at hand. Agents and other team members can also attach private messages to tickets to communicate any need-to-know information to the agent assigned to a given instance. 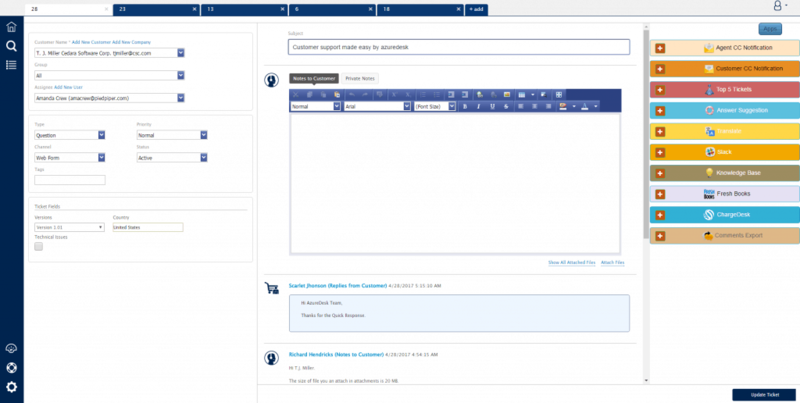 One of the main benefits of AzureDesk, as reported by its users, is its simple user interface. Basically, since pathways to specific tools is simple and straightforward, there can be little to no confusion for users as to how to go about accomplishing a specific task. Along with this, AzureDesk simply doesn’t offer more than it needs to. Rather than opening the door for users to get caught up in advanced features and functions, AzureDesk strives to enable organizations to focus on what’s important: providing support to their customers. Finally, AzureDesk’s support staff is reported to be incredibly responsive and helpful. As mentioned, you probably won’t have too many issues getting your organization moving with the tool, but if you do, the team is there to help you. Once again, while some users may love the simplicity of AzureDesk, other organizations may be left wanting in a variety of ways. Perhaps most obviously, companies looking for a tool to help them provide multi-channel support to their customers won’t find much use for AzureDesk. This isn’t a bad thing, per se; the software simply wasn’t made for multi-channel communication. Additionally, the lack of options and more advanced features may be a turnoff to some, as well. Customer-facing fields and forms aren’t very customizable, and the overall aesthetic appearance of the tool is rather basic. Lastly, reporting is lacking in both depth and breadth. That is, AzureDesk doesn’t provide much more than surface-level data on customer engagements and interactions, and it doesn’t allow users to go too far into the past to retrieve previously-collected data, either. In turn, this can lead to redundancies, missed opportunities, or other customer-facing issues that ultimately cause CX to suffer. As we wrap up this roundup of Zendesk alternatives, it’s important to recognize the objective value of each of these tools doesn’t matter as much as the value each will bring to your organization. That is, while some may be looking for an all-in-one customer support tool, others may be looking for a more simple and straightforward option to accomplish a specific task. With that in mind, take another look through this guide as you begin to narrow down your choices. Your best bet? Don’t opt for a more advanced tool because you “might” use the more advanced features at some point in the future. Rather, go with the tool that will help you solve your most pressing issues now, while keeping the door open for other options in the future. Why Customers STOP Using Your Knowledge Base! Under the Hood: Meet the Brand New Helpjuice V4 Dashboard! Copyright © 2019, Helpjuice Inc.
Why is a knowledge base important? 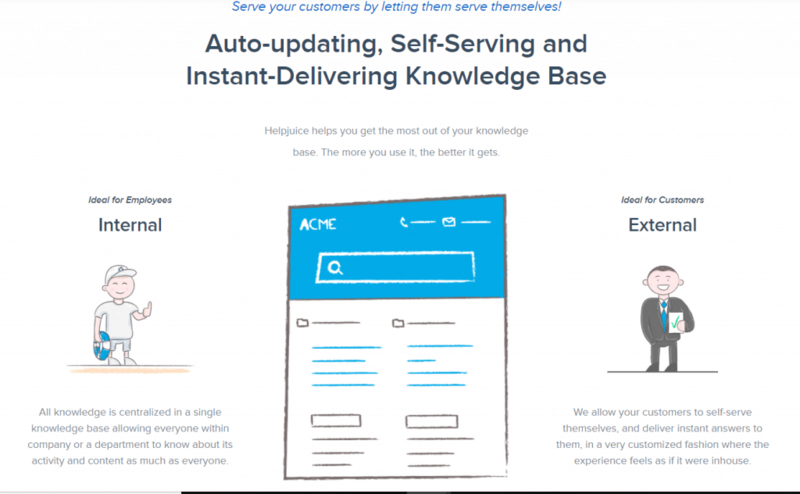 With a knowledge base, you can allow your customers to self-help themselves, thus reducing your customer support by up to 60%. Further more, you can also have your team get instant answers to the questions they need without having to email themselves all using knowledge base software. What is the purpose of a knowledge base? The purpose of knowledge base software is to allow you to host your knowledge base/corporate wiki in one centralized 'hub'. Both your customers, and employees can now access information within seconds!